NWL plans to produce a series of reasonably-priced, peer-reviewed, paperback academic books on lichens, with a focus on topics of regional interest, such as generic monographs, annotated state lists, ecological works, local floras, and symposium proceedings. Our purpose is to provide an outlet for very long papers and books of wide interest but that are too long for regular scientific journals. Volumes will be produced sporadically. We expect 0-2 volumes per year. Works on any aspect of lichenology will be considered. Vol 1 -- Biotic Soil Crust Lichens... reprinted an much improved Sept 2018! See below. 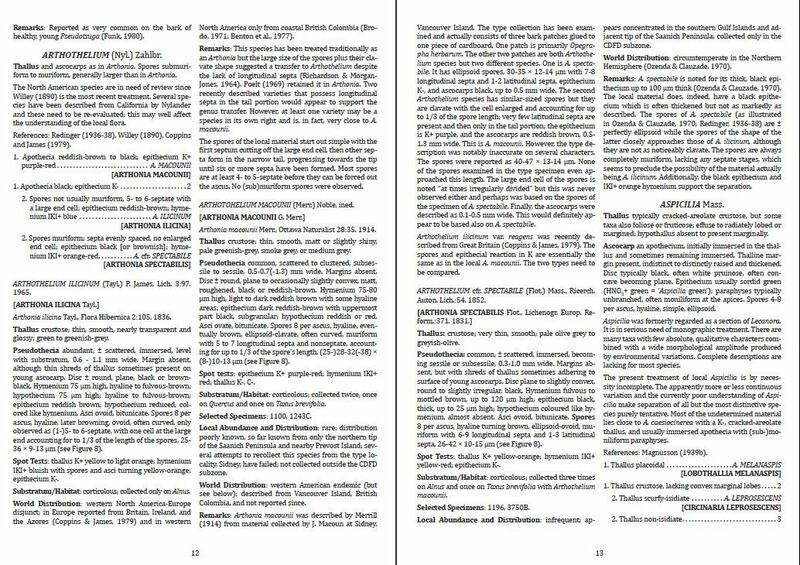 All volumes are listed in reverse order (3, 2, 1) below. Number of books and shipping charges will be set at checkout (domestic shipping is inexpensive (book rate), international shipping is expensive. Noble, W. J. 1982, Reprinted in 2017 with nomenclatural updates by Michael Haldeman. The Lichens of the Coastal Douglas-Fir Dry Subzone of British Columbia. Monographs in North American Lichenology 3: 1-260. Pbk. $30. Keys and full descriptions, B/W line drawings of spores. 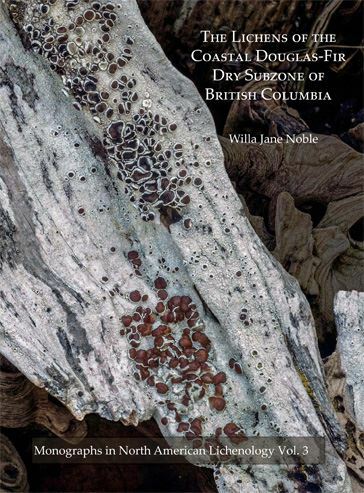 The single most valuable book for people interested in learning the crustose lichen flora west of the Cascade Range has been Willa Noble’s unpublished Ph.D. dissertation. This massive work contains an excellent lichen flora for a portion of British Columbia. But its importance extends well beyond that. 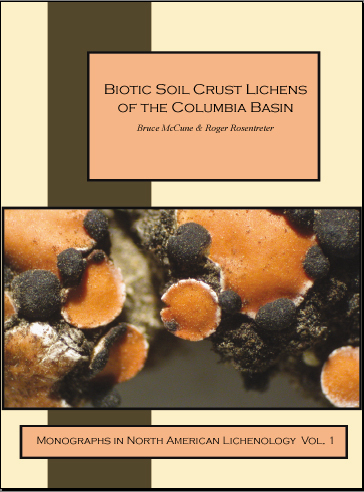 It is an indispensable reference work for lichen studies from Alaska to northern California. McCune, B., R. Rosentreter, T. Spribille, O. Breuss and T. Wheeler. 2014. 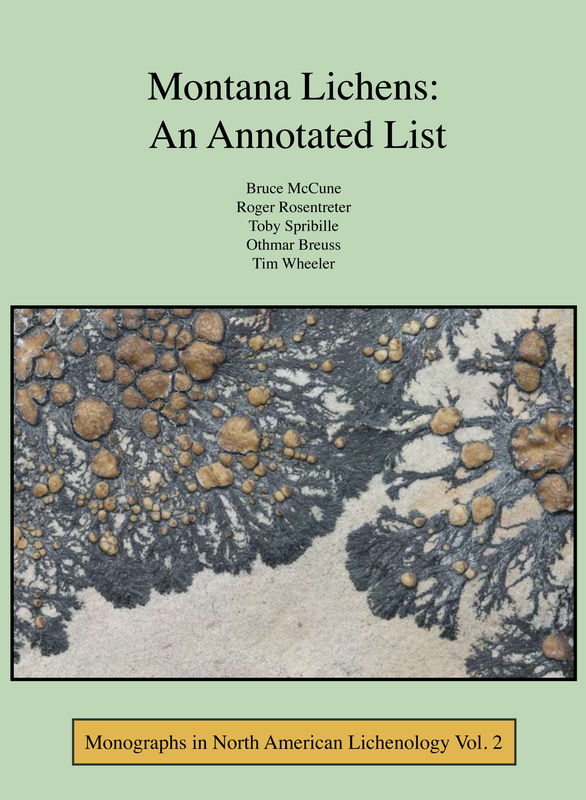 Montana Lichens: An Annotated List. Monographs in North American Lichenology 2: 1-183. Pbk. $30. This is the first comprehensive summary of the occurrence, literature references, and ecological context for lichens in any state or province in the Pacific Northwest or northern Rocky Mountains. Because we also include reports from adjoining states and provinces, the book should be useful in a broad area. The monograph will be an invaluable reference for people delving into crustose lichens. So far, a total of 1074 species are documented from Montana. Of these, 283 species are new for the state and 19 are new to North America. We discuss the rare, threatened, and endangered lichens of Montana. Priorities for surveys and monitoring are evaluated by placing species in one of eight categories, based on all combinations of global rarity, ease of detection, and habitat vulnerability.